NeNe Leakes is taking to her Bravo Blog to dish on this week's episode of The Real Housewives of Atlanta. 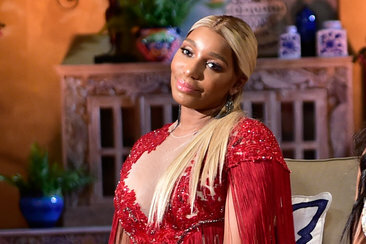 NeNe Leakes reacts to Kenya Moore and Marlo Hampton's blackmail drama and explains why she won't be friends again with Sheree Whitfield and Kim Zolciak-Biermann. NL: I’m just trying to understand why we’re talking about this now! This whole Marlo/John thing happened some years ago. No one was trying to bring it up back then or speak up in support of me; it’s only coming up now because Marlo and I are cool. I feel like some of these girls think it will drive a wedge between Marlo and I. All these girls were happy to talk, take pictures, and even hang out with Marlo. Nobody spoke up in support of me then, so why now all of a sudden? NL: The very people that I have helped to be on RHOA have been the same ones that have tried to bring me down the most. I am not perfect — I make mistakes. I’ve said things at times that weren’t the kindest, but what I’ve also done is tried time and time again to put the past behind me, make amends, and move forward. Sometimes you just have to move on for the betterment of yourself. So in this case, as far as Shereé and Kim are concerned, the door is CLOSED and LOCKED.